McCarthy Toyota would like to congratulate Derik Larimore for earning the distinction of Toyota Master Certified status. In today's challenging business environment, the value and importance of a well trained and ambitious technician cannot be understated. Derik is part of an elite group of Toyota Technicians in the United States. 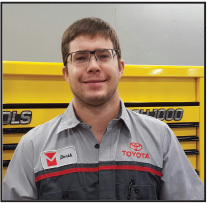 With his 10 years as a certified automotive technician and 7 years as a certified Toyota technician Derik is a benefit to McCarthy Toyota of Sedalia, as his skill set helps us work to provide an excellent customer service experience. As he's Toyota Master Certified on all Toyota systems, Derik serves as a leader and mentor for other Technicians. McCarthy Toyota is proud of Derik and his accomplishments and is glad to have him as part of the McCarthy family.